John Levy has been a writer since 2007, contributing to the "The Guardian" and "Waitrose Magazine." He has also worked as a human nutrition researcher at Edinburgh University and Nutrition Consulting. Levy holds a Master of Science in sports and exercise nutrition. A combination of engineering and hardworking honey bees produces honeycomb, the capital feature of the beehive. The advanced structure consists of flat upright hexagonal cells made from secreted beeswax. 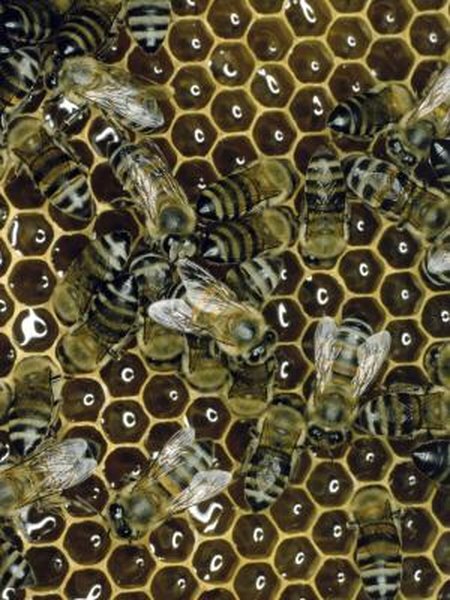 The honeycomb cells are used to lay and raise queen eggs. Although honeycomb itself has limited benefits, its content has several benefits spanning the cosmetics, food and financial industries. The pollination by bees is worth an estimate of $16 billion in the U.S. alone, according to the University of Illinois. Honeycomb contains natural honey, which contains portions of the comb. Honey is one of the sweetest and oldest commodities available. According to “The Beekeepers Handbook”, honeycombs can be reused to store honey by beekeepers. This is done by opening the capped cells with a preheated blade and using a honey extractor to harvest the honey. The beekeeper can then return the honeycomb to the hive for the working bees to continue production rather than building a new honeycomb. The honeycomb structure is used as inspiration for many natural cosmetic products particularly soap molds. According to Anthony C. Dweck in "Formulating Natural Cosmetics", honey is also an ingredient in natural skin care products because it has antiirritant and antioxidant properties, and a natural fragrance. The antioxidant protects the skin from UV ray damage according to Kay Zetkin of the Western Beauty Institute. Beeswax contains vitamin A, which is beneficial for softening the skin and repairing damaged skin cells. Because of its pliable nature beeswax is added to hand creams and soaps. Beekeeping involves the management of beehives and working bees; however the economic treasure is in the honeycomb. The comb is where the honey and pollen are stored; it is also made from beeswax. According to the University of Illinois, honey production from about 135,000 American beekeepers managing approximately 2.44 million bee colonies produce an estimate of $150 million worth of honey. Honey is effective in treating minor abrasions because it contains antimicrobial agents. Dweck writes that the natural honey contains more potent minerals and vitamins than processed honey. Magnesium, iron and potassium are among the minerals produced from natural honey. It also contains vitamins thiamin, riboflavin, ascorbic acid, panothenic acid and nicothenic acid which are essential nutrients that promote cellular damage repair and reduces chronic disease. Beeswax can be extracted from the honeycomb and used to make candles. Beeswax candles don’t drip and they burn longer than paraffin. Unlike soy candles and paraffin they don’t need to be scented because they produce a natural fragrance from the honey, according to Howland Blackiston in “Beekeeping for Dummies”.